The online collection, “Critical Comics,” serves as a prototype for the digital component of the Graphic Narratives Network. It brings together archival materials from MSU’s Special Collection Comic Art Collection and digital humanities techniques to investigate the evolving relationship between text and technology – in print and on the screen. 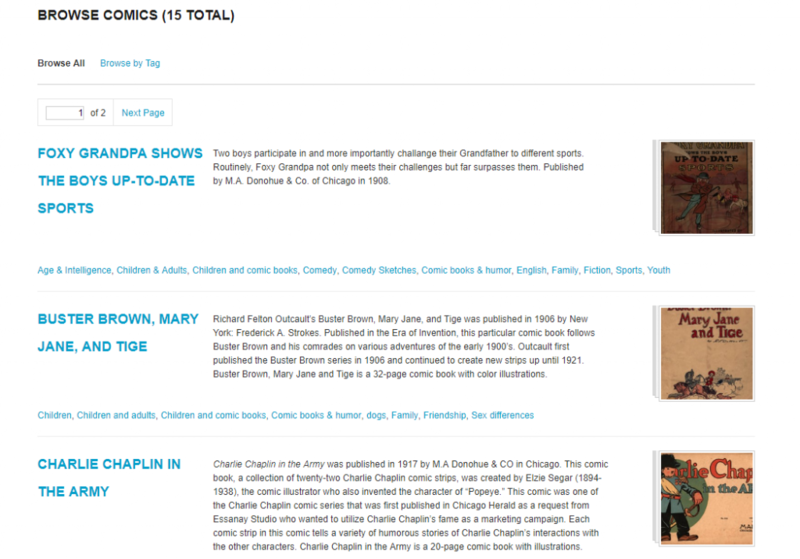 A product of two AL/DH 340 Seminar in the Digital Humanities (Spring 2017 and 2018), the site provides high-resolution scans of 15 international comics and, using the metadata of approximately 5,000 comics in MSU’s Comic Art Collection, contextualizes this set of texts in comic’s “Era of Invention,” before the rise of the superhero genre in the 1930s. “Critical Comics” combines greater access to early-twentieth century comics with a series of critical investigations into the political and aesthetic effects of the technological manipulation of texts and images. Accessible under the “Methods” and “Analyses” sections, these reflections explore the consequences of datafication on cultural objects, the practice and theory of constructing an archive, the geographies of the comics as products of the printing industry and as narratives spaces, and the abilities (and limits) of visualization tools to tell alternative histories of early-twentieth century comics through data. Its goal is to reframe current debates over digital cultures and the digital approaches to the humanities as a continuation – rather than a radical break from – a history of mass media in which comics play a salient role. While scholars have explored the critical significance of comics (see Chute and Jagoda), this project’s synthesis of comics and critical theory serves as an intervention in current debates over the critical potential of the digital humanities. For instance, Alan Liu asked already in 2011 why digital humanists had not yet brought digital techniques to the full register of societal, political, and cultural critique – a question often echoed by scholars skeptical of digital methods. “Critical Comics” builds on how some digital humanists, such as Miriam Posner, have answered Liu’s call by arguing that the criticality of the digital humanities lies not only in redefining the parties who have access to representation, but also in its total reconfiguration of the mechanisms of digital representation. More robust cultural critique, Posner claims, “is not only about shifting the focus of projects so that the feature marginalized communities more prominently; it is about ripping apart and rebuilding the machinery of the archive and database so that it does not reproduce the logic that got us here in the first place.” By tailoring its collection to comics as a media form that has been marginalized in literary studies, “Critical Comics” participates in this attempt to rebuild “the machinery of the archive and database.” But “Critical Comics” argues that the critical value of digitization and digitally-informed analyses lie in their ability not only to correct for negativity – marginalization, the faulty “logic” of the archive – but also to retain this negativity in language and the writing of history. Entries in the “Methods” section, for instance, examine and expose for the site’s users the material elements of the comics lost during the processes of datafication and digitization. Beyond making these early-twentieth century comics available to a broader public audience, this site employs the digital medium to create a constellation of primary sources and critical analyses that enables readers to explore and understand the advantages and limits that technology has brought to cultural production throughout the past century.